Vitaminor 450gr by Natural is brewer's yeast grown in must, grains and sugar derivatives. The raw material is only obtained from the breweries. It dries completely and is prepared with great care for detail without the addition of any chemical agent. It completely preserves the nutritional qualities of each of its natural constituents. It is a 100% natural product rich in amino acids, vitamins and elements, organic minerals that are fully assimilated by the organism of the pigeon. VITAMINOR provides a complex of natural B vitamins, which are important for metabolism, sugars, proteins and fats, important in the physiology of stress in racing. B vitamins therefore have a positive influence on the physical exertion, which the pigeon needs to produce. 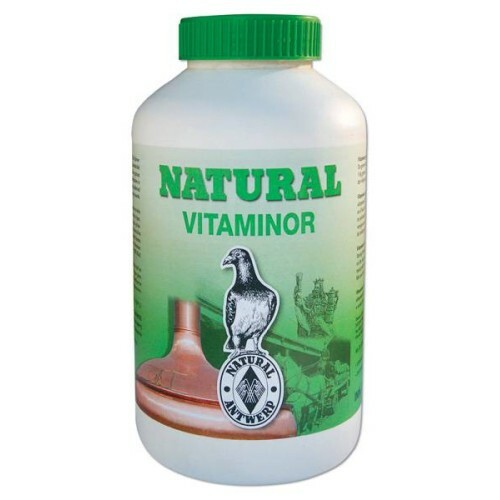 VITAMINOR is a growth factor in the diet of young pigeons and improves their resistance to various diseases and stress. It is an established fact that VITAMINOR brewer's yeast has a very favorable effect on the fertility of the breeding stock and on the vitality of the young.
. Mix a spoonful of well-filled Vitaminor coffee or the amount of the bottle cap with 1 kg of grains.
. For best results moisten the grain with garlic oil, lemon juice or water ... to ensure a better adhesion of VITAMINOR to the kernels. - During the breeding and moulting season: add at least twice a week to the grain ration. - Before the racing season: 10-day diet during which Vitaminor brewer's yeast is added to the grain ration to stimulate the physical condition of the pigeons. 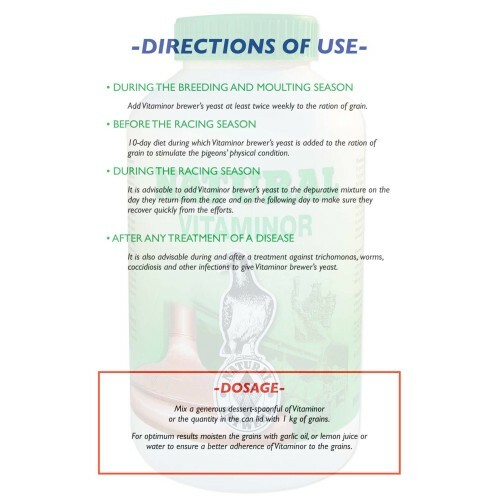 - During the racing season: It is advisable to add the Vitaminor brewer's yeast to the depurative mixture the day they return from the races and the next day to ensure that they recover from the stresses. - After any treatment with antibiotics: It is also advisable during and after a treatment against trichomonas, worms, coccidiosis, cancer and other infections.